General George Washington and his ragged troops retreated from Fort Lee on November 20, 1776, across the state of New Jersey, finally crossing the Delaware into Pennsylvania ahead of the oncoming British, who arrived behind them on the 8th of December. General Charles Lee, despite Washington’s pleas to join him immediately, was taking his time moving across the Hudson River in New York state. In fact, it is unlikely that Lee was planning to join Washington any time soon. Lee had little nice to say of Washington, and hoped to replace him as the lead American general. Instead of uniting forces with Washington on the Pennsylvania side of the Delaware, Lee thought it might be better for him to launch a surprise attack against the British in New Jersey. Lee crossed over the Hudson to Peekskill, New York on December 2nd and had only made it to Morristown, New Jersey as the remnants of Washington’s force finished crossing the Delaware to Pennsylvania. On the night of December 12th, Lee decided to stay with only a small detachment of his men at the tavern owned by the widow White, in Basking Ridge, instead of with his main force in Vealtown (present-day Bernardsville). This would prove a costly mistake. The British commander, General William Howe, knew Lee was on his flank, and thought he had with him about 3,000 men (Lee had only about 2,000). In this dangerous situation, Howe continuously kept reconnoitering parties in the field to keep tabs on Lee. General Charles Cornwallis dispatched a patrol from Pennington on 12 December. Lieutenant Colonel William Harcourt commanded this patrol of about thirty from the British Sixteenth Regiment of Light Dragoons (dragoons were light cavalry soldiers). A twenty-two year old subaltern, Cornet Banastre Tarleton, was given command of a party of six advance guards. 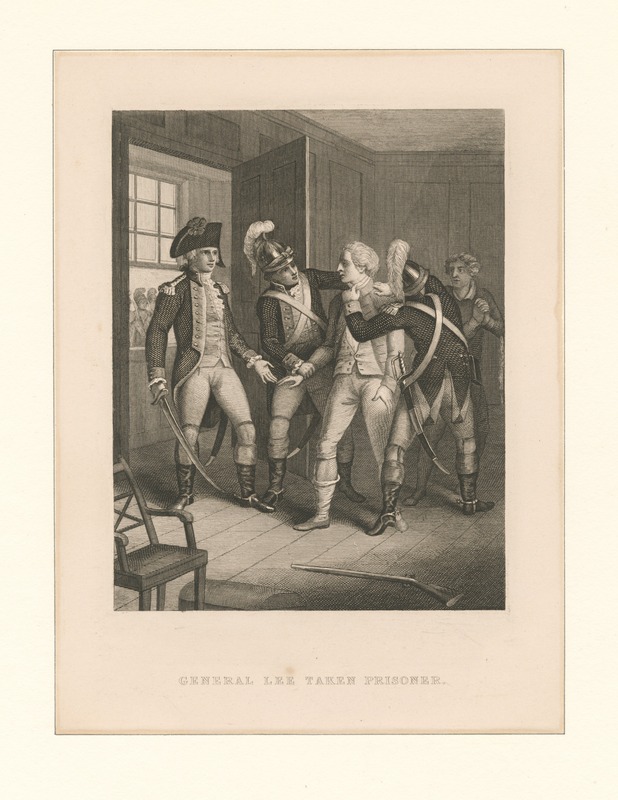 On December 13th, after crossing the Raritan River, the guards chanced upon a sentry guard of the rebels. He was shot down before he could fire at the British. Moving forward, a second American sentry was found, but was seized and questioned. An express rider, most likely Elder Samuel McIlrath, of Mendham, was also captured, and it was he who led the British towards the widow White’s Tavern, under the threat of death. It was ten in the morning of the 13th before Lee sat down for breakfast. Lee had spent the morning arguing with officers of the Connecticut Light Horse, and conversing with his staff on possible movements. Tarleton, meanwhile, approached the house, and ordered his men to surround it and kill anyone who resisted. At their approach, a young major, James Wilkinson, who had delivered a letter to Lee at four that morning, happened to glance out the window, and alerted Lee of the British presence. Lee’s guard, of eighteen to twenty-five men, were billeted in a nearby barn, and were alerted only when the British troops made themselves known. Four or five of Lee’s men were killed, and the arms of at least two were severed. Lee now saw that resistance surely meant death, and decided to surrender himself to the British. As the widow White begged for her tavern to be spared, Lee gave himself up as a prisoner. Still dressed in his sleeping gown, he requested that he be able to dress himself; the request was denied, and Lee and Colonel Boisbertrand were hastily taken to Pennington by the British, while the others in the house made their escape. After the British left the area, Wilkinson hurried to his horse and rode off towards General John Sullivan, who was en route to Pluckemin with his men. When Wilkinson informed Sullivan of what had happened to Lee, Sullivan took command of Lee’s troops and continued the march to Washington’s camp on the Delaware. By December 20th, with the arrival of Sullivan’s men, Washington had about 6,000 soldiers, with more on their way. Less than a week later with this larger force, in a stroke of brilliant genius and with some luck, Washington’s army would cross the icy Delaware River in a blinding snowstorm and launch a successful surprise attack on the Hessian garrison at Trenton. Smith, Samuel Stelle. The Battle of Trenton. Monmouth Beach, NJ: Philip Freneau Press, 1965, p. 9. Alden, John R. A History of the American Revolution. New York: Da Capo Press, 1969, p. 281.
 von Muenchhausen, Friedrich. At General Howe’s Side: 1776-1778. Translated by Ernst Kipping. Monmouth Beach, NJ: Philip Freneau Press, 1974, p. 7. Smith, Page. A New Age Now Begins Vol. One. New York: McGraw-Hill Co., 1976, p. 809. Archibald Robertson: His Diaries and Sketches in America, 1762-1780. Edited by Harry Miller Lydenberg. New York: New York Public Library, New York Times and Arno Press, 1971, p. 116; and Dwyer, William M. The Day is Ours! New York: The Viking Press, 1983, p. 146. McCullough, David. 1776. New York: Simon & Schuster, 2005, p. 285. Previous Is This What We Want For Our Future?